I meet many homeowners who dream of having custom cabinets in their kitchen. I can’t say that I blame them; who wouldn’t love to have cabinets specifically designed for their space? Fully custom cabinets offer maximum flexibility, but they are also the most expensive cabinet option. These cabinets don’t always fit our clients’ budget. How can you get the look you want for your kitchen and still work within the confines of a budget? If you’re looking to combine flexibility and affordability, semi-custom cabinets are a great option. Semi-custom cabinetry takes standard stock cabinets and allows you to make them your own. What exactly are semi-custom cabinets? The basic answer is that they are stock (pre-made) cabinets that are able to have specific design details customized. You can choose a basic cabinet and select the trim, molding, finish, and hardware that suit your taste. Certain dimensions can also be altered on semi-custom cabinets, like the depth of your cabinets or the sizing of your door fronts. This combination of stock and custom allows you to have input into your design without the custom cabinet price tag. 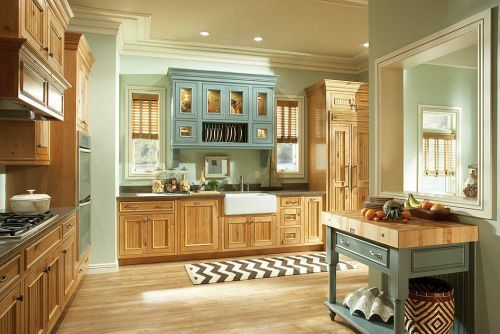 One of our most trusted vendors for providing semi-custom cabinets is Medallion Cabinetry. I love working with Medallion because they offer affordable semi-custom cabinets, but their quality is still top-notch. They offer modern and classic styles, so you’re sure to find something that fits your home and your personal taste. If you’re interested in learning more about semi-custom cabinetry, we’ll be conducting a free seminar on April 23rd with Medallion Cabinetry. 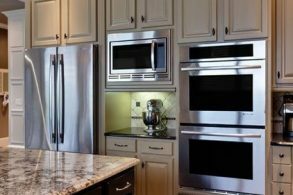 You’ll learn more about their products, our services, and how semi-custom cabinetry can help make your kitchen beautiful and unique. There will be refreshments, and you’ll have the opportunity to ask questions in a pressure-free setting. If you can’t make it Thursday, you can stop by our showroom any time to learn more about these and our other great options for your kitchen. We can help with every aspect of your remodel, from cabinets and countertops to appliances and flooring. Contact us today to find out how we can make your home transformation simple and seamless.